This is part six of seven in my attempt to explain how you should invest in your retirement portfolio. Click here for part five. In a nutshell, portfolio rebalancing is when you check up on your portfolio at certain intervals of time and make sure that the percentage of each asset class in your portfolio remains close to the percentage that you originally set for it (as discussed in part 3). Here is a quick illustration: Lets say I bought $1,000 each of two funds for my portfolio – a stock fund and a bond fund – and I want each fund to make up 50% of my portfolio at all times. After 1 year, my stock fund went up 20% and my bond fund declined 5%. As a result I had $1,200 in my stock fund and $950 in my bond fund. My total portfolio value gained a little to become $2,150, but now had 55.8% (1,200/2,150) of my portfolio in stocks and 44.2% in bonds. Because it is important for me to maintain a 50/50 split in my portfolio to reduce risk I would sell shares of my stock fund and buy shares of my bond fund so that each fund would have half of my new portfolio value which was $1,075 (2,150/2). This is called portfolio rebalancing. Are humans really that bad at market timing? Dalbar Inc. is a Boston based research firm that publishes an annual report called the QAIB or Quantitative Analysis of Investor Behavior. They charge $99 to see the annual report, so I haven’t seen it with my own eyes, but I did read a book called It’s Not about the Money by Brent Kessel which described a recent QAIB report. According to the book, the report studied the actual returns of all investors in equity mutual funds from 1987 to 2006. The report showed that the average investor would add money to their investment account when the market went up, and then take out money when the market went down. As a result of this behavior, the typical investor grew $10,000 into $23,252 in 22 years. Over the same time period, the S&P 500 grew $10,000 into $93,050. In this example we are talking about people who are simply investing in mutual funds – NOT investing in individual stocks. As I have explained above, mutual funds are essentially index funds, except they have a 1-2% smaller return. So what this study is really saying is that the reduction in gains is not a result of picking the wrong stocks, but simply buying and selling at the wrong time. Its just human nature to want to trade too much and to go after the “hot fund.” Its almost like we can’t help ourselves from selling low and buying high – and that is why portfolio rebalancing at set intervals is so successful. You won’t worry about getting in your own way. How often should I rebalance my portfolio? I was so in love with the idea of portfolio balancing that I was ready to rebalance my portfolio once a month. I wasn’t sure how I was going to make the numbers work – because as explained in part 5, the commissions associated with making 10 trades a month were pretty high. As it turns out, there really is no right answer – there are studies that show monthly rebalancing to be the most effective, and other studies that show annual rebalancing to be most effective. Still other studies suggest that its not the time period that should trigger your rebalancing but whether your original asset allocation is broken by a certain percent (like 10%). Regardless of time period or other method you choose to trigger your rebalancing, the important thing is to come up with some way to adjust your portfolio that will take any emotion or attempt to time the market out of the equation. Based on my research it seems like rebalancing your portfolio annually is a safe approach. But just because you rebalance annually, it doesn’t mean you should be putting money into your retirement portfolio only once a year. As I explained at the end of Part 5, once a year investing reduces your return because your money wasn’t in the market getting 8% a year, and is risky because you are not paying yourself first. So in the end, even after taking into account annual rebalancing, it is still important to put money into retirement once a month – which means there is really no way to avoid paying large amounts of money just in trade commissions. With this realization I decided to revisit target date funds. To continue reading, follow the link to Part 7 – The Solution. This is part seven of seven in my attempt to explain how you should invest in your retirement portfolio. Click here for part six. So what exactly are target date funds (TDFs)? At their core, TDFs are mutual funds. But unlike mutual funds which might own individual stocks, TDFs are “funds made up of other mutual funds.” In other words, TDFs do not directly own individual stocks but instead they own index funds, or a bunch of mutual funds in order to provide the investor an appropriate asset mix for retirement (like the asset allocation strategies mentioned in part 3). In general, TDFs are composed of four primary asset types: 1. US Equity (Stocks and Real Estate) 2. International Equity, 3. Bonds, and 4. Cash Reserves. The percentage of the fund’s money in each asset depends on the fund’s target retirement date. For example, Vanguard has a “2020” fund, a “2025” fund, a “2030” fund…. all the way up to a “2055” fund. If you plan to retire in the year 2055, you should buy the 2055 fund. The 2055 fund will have more of its assets in stocks than the 2020 fund because more risk is acceptable with retirement that far off. But the asset allocation of the 2055 fund will not always remain the same. An important feature of target date funds is that the asset allocation will change (and become more conservative) as you get closer to retirement without you having to buy a different fund. So while the 2055 fund may have 90% of its assets in stocks and 10% in bonds today, in the year 2045, your “2055 fund” will have something like 60% stocks and 40% bonds. Target date funds were created to be a one stop shop for investors. You start putting money in to one fund in your 20s, and you will continue to put money in that same fund all the way into retirement. You don’t have to worry about buying different funds to make sure you have the appropriate asset allocation in your portfolio because your target date fund is automatically diversified and rebalanced every year. Further more, like mutual funds, you don’t have to pay a trade commission every time you put money into it. So when I first read about TDFs at my HR orientation, it all sounded too good to be true, and I wrote them off because I figured they would have high expense ratios – just like most other mutual funds. But after months of research on how to be a do-it-yourself investor using index ETFs, I finally concluded it was impossible to overcome the high costs of making online trades – even if it were as few as 3 trades a month. If I invested $6,000 a year with my ETF strategy, my retirement portfolio would have an effective expense ratio of 6.92%, meaning I would be better off buying mutual funds. So as much as I had tried to avoid it, it was finally time to reconsider Target Date Funds. 0.19%! Needless to say I was shocked at how low Vanguard’s expense ratio was, and honestly a little skeptical. Just for reference, the weighted average expense ratio of all 10 index funds in my preferred asset allocation (described in part 3) was also 0.19%. By that I mean if you multiplied the expense ratio of each index fund in your portfolio by its allocation percentage you would get your portfolio’s weighted average expense ratio. For example, the cheapest Vanguard index fund (I’m using vanguard instead of Schwab because overall having a Vanguard account is the cheaper option) for the “Total Stock Market” is VTI with a 0.07% expense ratio. The cheapest fund for High Yield Corporate Bonds is HYG with a 0.50% expense ratio. To get the weighted average you would multiply VTI’s 0.07% by VTI’s allocation percentage (25%), add the product of HYG’s 0.50% ratio and HYG’s allocation percentage (5%), and on and on for each asset. Though both Vanguard’s Target Date Fund and my ETF portfolio would have the same expense ratio, it is clear that the Vanguard TDF is a much better deal because I wouldn’t have to pay any money on trade commissions (though I still would have to pay the $20 annual account fee). Even with the obvious solution in front of me, I was curious to know why there was such a difference in expense ratios for funds that were supposed to do the same thing. I suppose that what you are paying for in the extra expense ratio is having your TDF be EXTRA diversified. The question then is simply this: Is a three fund portfolio properly diversified? That is probably a question better debated by academics than myself, but I know I feel pretty comfortable with it, especially when considering the drawbacks of the other two funds. Both the Fidelity and T. Rowe Price funds are made up of actively managed mutual funds – NOT index funds like the Vanguard TDF. 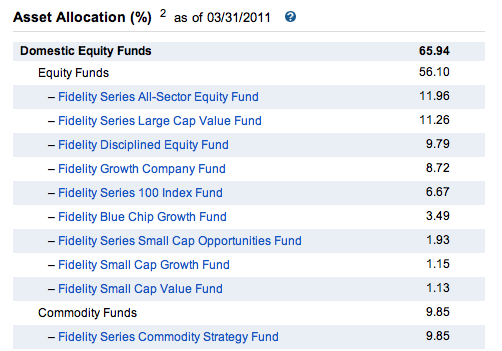 Take Fidelity’s “Small Cap Value Fund” (shown above) for example. Its investment strategy is to invest “at least 80% of assets in securities of companies with small market capitalizations,” and to invest in “securities of companies that [the manager] believes are undervalued in the marketplace.” This is taken straight from Fidelity’s website. In other words, some guy is picking and choosing what stocks to be in that fund, and as discussed in Part 2, actively managed funds generally do not beat their relevant indexes. Furthermore, you’ll note that the “Small Cap Value Fund” is part of the US Equity assets, yet it says in the fund’s prospectus that it holds 5% of its assets in international companies! It’s hard to feel comfortable with a fund whose real asset allocation is almost impossible to compute, much less decided by active management strategies. The Decision: In case it is not completely obvious by now, I decided to take my talents, or my money rather, to Vanguard’s target date fund. Admittedly, I gave up a few things in making the decision. First, I gave up on the idea that appropriate diversification meant having 10 different funds in your portfolio. I could have bought one of the other target date funds with a more nuanced diversification – but as I said, I was not comfortable with buying a fund that was composed of actively managed funds. The second thing I gave up was approximately $2,100 over 30 years. As it turns out, I can buy the same three funds used in the Vanguard TDF for free with a vanguard account which would result in a weighted average expense ratio of 0.11% percent, compared to the TDF’s expense ratio of 0.19%. That 0.08% difference adds up to about $2,100 in 30 years. The way I justify this expense is that I am essentially paying $70 a year to have someone rebalance my portfolio and automatically change my portfolio’s asset allocation as I get older. To me, having absolutely no stress and no responsibility for my retirement portfolio is worth $70 a year – it may not be for you. So thats it. I went from scoffing at target date funds to being a proud owner of Vanguard’s VFIFX fund – and not because I wanted to, but because that was the smartest (and easiest) thing to do. Hopefully, I’ve convinced you to do the same, but if not, at the very least I hope that you’ll agree that the logic I used to make that decision is sound.